Client: Jurys Inn Hotels, a well-established chain of hotels around the UK and Ireland. Content: A comic strip that celebrated the history of Glasgow and Edinburgh, where Jurys had recently opened two new hotels. 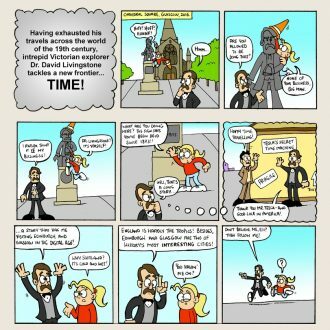 The comic was a fun way of bringing attention to the new hotels in Scotland, as well as highlighting tourist attractions and features of the two cities. As well as writing the script for the comic, I liaised with the cartoonist, who had previously worked for publications like The Beano and Private Eye, to produce the final artwork. Results: 10 high quality backlinks from Scottish tourism sites and publications, including The Daily Record.